However, humanely trapping a cat becomes a major challenge when you have a boat load of outdoor-access cats in the immediate area. It is also difficult when you deal with a cat that is hesitant to go into a humane trap because they’ve been caught in a trap before. Those were the two challenges I faced when I was asked to help my blind neighbor Georgina recover her missing cat Buddy in Federal Way, WA. Here’s a diary of my challenges and what I learned through the process of bringing Buddy back home. My neighbor Caroline stopped by to tell me that my neighbor Georgina had lost her indoor-only cat. Buddy, a neutered longhaired white male cat, was missing. Although no one saw it happen, they believed that Buddy must have escaped outside when a door was left ajar by a visitor. Because of a previous commitment, I was only able to respond and conduct a quick search around the outside of the house (with my 2 million candlepower spotlight). I did not find Buddy but told Georgina that I’d be back the next day. When I arrived the next evening, Georgina told me that her granddaughter saw Buddy hiding under the front porch. But Buddy bolted and was no longer under the deck by the time I got there. I went ahead and set two baited humane traps: one right next to the front porch and one in the backyard next to a large deck. 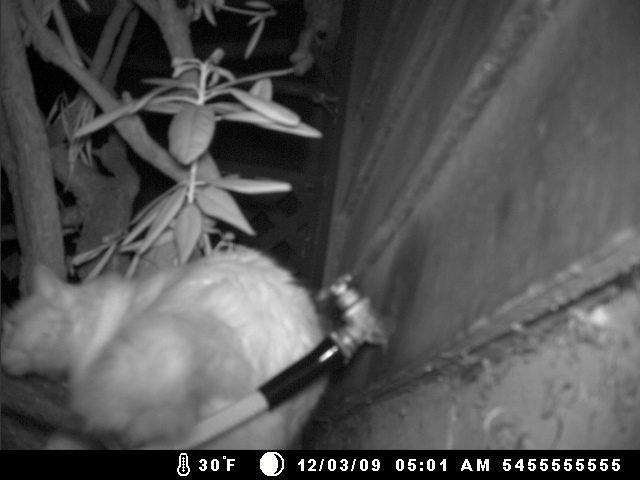 In addition, I set up two motion activated digital wildlife cameras at both traps to observe the cat activity around the traps. I returned the next morning and reviewed the photos. During the night, we had caught a neighbor’s cat in the trap but not Buddy. I did manage to capture Buddy on camera and confirmed that he was still in the area. At 5:01 a.m. he had huddled in the area of the trap, but he did not enter it. I figured he probably wasn’t hungry enough. I returned that evening and set two traps in the front yard – one by the front porch and one under a bedroom window. The next morning I learned that once again, we had trapped another neighbor’s cat but no Buddy. I suggested that the family talk to their neighbor’s and ask them to keep their outdoor cats indoors but that didn’t go over well. I pulled the cameras and reviewed the photographs. 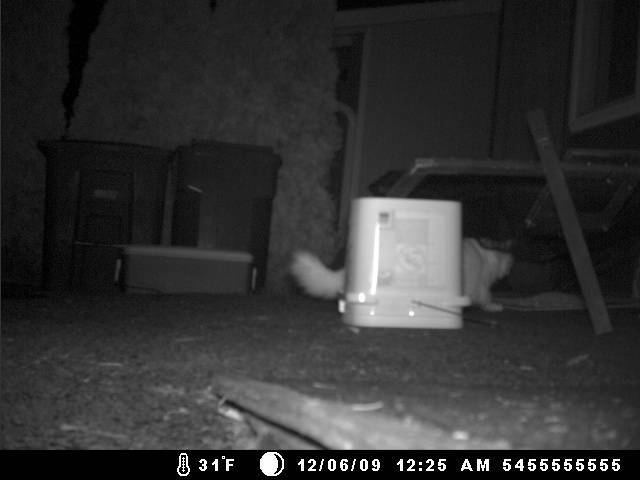 We had captured Buddy on camera four different times in the area of the trap. I began to suspect that Buddy had passed up a few opportunities to enter the trap but I wasn’t sure of this. It turns out that Georgina’s granddaughter saw Buddy but he bolted and ran three houses down. She talked to that neighbor and asked her permission to search her yard but the neighbor refused. While this was discouraging, it was encouraging knowing that Buddy was continuing to come back to his home. The next morning I learned that once again we’d trapped a neighbor’s cat and not Buddy. I decided to reduce our traps down to just one trap by the front porch. I explained that the family needed to be diligent to release any wrong cats immediately and restock it with warm food to entice Buddy into the trap. Sadly, the relatives who were supposed to help me (by baiting the trap again) fell down on the job. On a few occasions I found the trap set but no bait inside. I knew that I’d never catch Buddy without their cooperation. To make matters worst, I reviewed the photographs and was dismayed. At 12:43 a.m. Buddy walked straight towards the open trap (which I’m not 100% convinced had bait inside of it). However, Buddy did NOT enter the trap. Instead, he proceeded to sit down right next to it and look directly at my camera as if to mock me! Buddy Mocking Me and My Trap! He may as well have stuck his raspy little tongue out at me! It became abundantly clear that I needed to change tactics. No more humane traps for Buddy. I was ready to pull out the big guns! GAME ON, BUDDY! I realized that I need to switch to using a drop trap (here’s a video of a drop traps being used). A drop trap is a large net device that is propped up by a stick attached to a very long string. 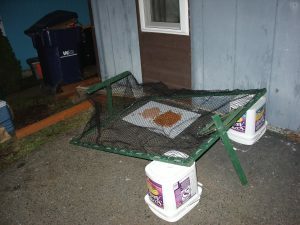 A bait station is placed underneath the propped up trap. When a cat comes under the trap to eat the food, the trapper yanks on the string which pulls the stick out and drops the trap. The cat is then caught in the net. Drop traps remind me of the Wiley Coyote vs. Road Runner cartoons with the ACME box propped up with a stick. In this case, I was the cleaver Road Runner! 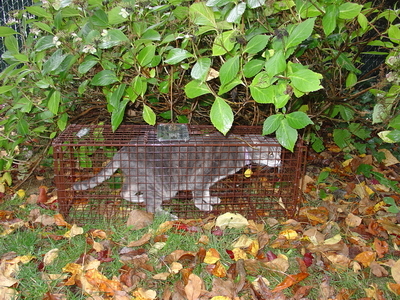 Drop traps are great for hard to catch cats like Buddy who refuse to go into a humane trap. But the problem with drop traps is that they are surveillance based. That meant that this technique would require my sitting outside, perhaps for a few frigid hours, as I waited for Buddy to go under the trap. For that first night, I did not plan to conduct surveillance. Instead, I propped the drop trap on top of two buckets so that it could not possibly fall. I warmed up 3 cans of salmon cat food and piled 3 cups of dry cat food onto a white piece of cardboard. The plan was to encourage every cat in the area (including Buddy) to come and fill their bellies by going under the trap. 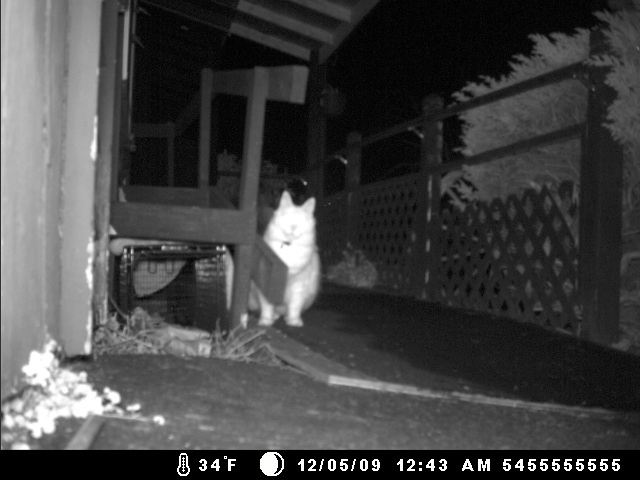 I set the wildlife camera up so I’d know whether Buddy went under the trap and how often. Today I went to pick up my camera early in the morning and saw that the pile of wet cat food was all gone. I looked at the photos and discovered there were a total of six different cats, including Buddy, who feasted under the trap. Buddy was caught on camera at 9:44 p.m., 10:32 p.m., 11:11 p.m., 12:25 a.m., 2:21 a.m., 3:09 a.m., 3:50 a.m., and 4:05 a.m. The photographs were evidence that Buddy was very comfortable with going under the drop trap. I was hoping this would make for a quick capture since the temperatures were supposed to drop into the low 20’s. I returned at 6:45 p.m. and set the drop trap. This time I propped it up with the wooden stick and attached the long string that ran from the trap-stick-thingy all the way through the driver’s side window (cracked open) of my SUV parked in front of Georgina’s house. It was freezing and I didn’t want to run my engine and scare Buddy, so I was thankful that I wore warm clothing. Ten minutes after setting up, a car alarm went off a few houses down. It blared for nearly an hour. I was so frustrated that I almost gave up. There was no way that Buddy would come out as long as the alarm was going off. But I waited it out and at about 7:50 p.m., the alarm stopped. I decided to sit and wait a little longer. I kid you not, right when I was about to open my door and give up for the night Buddy meandered up to the trap. It was 8:06 p.m. and it all happened so fast. Buddy slipped under the trap and started feasting, I yanked on the string, the stick flew, the trap fell, and Buddy jumped around like a wild animal. I leapt from my SUV and got to Buddy before he could work his way out of the trap by his flailing around. After a very difficult struggle (hissing, spitting, growling, biting…this was Buddy doing this, not me) I was able to get Buddy safely into his home. He darted under Georgina’s bed where I suspect he will probably stay for a few days! The help that I offered to Georgina is exactly what Missing Pet Partnership envisions will one day be available in all communities through trained volunteer lost pet search-and-rescue teams. We’re starting first in Seattle and if we make it through the recession and find the funding, we’ll train other volunteer groups nationwide. If I had not stepped in to help capture Buddy, I have no doubt that Georgina would’ve eventually given up. Buddy would have been absorbed into the stray/feral cat population like so many other cats, many of which ultimately end up in animal shelters where they are euthanized. As much as funding is always needed, I did not charge Georgina for our services, primarily because I know she is disabled and just doesn’t have money. Although it is not tax deductible, if you’d like to support MARN efforts to train people to recover more cats like Buddy, please consider making a donation via PayPal (please list as donation) or you can send a check to Missing Animal Response Network % Kat Albrecht, 424 W Bakerview Rd, Suite #105-360, Bellingham, WA 98226. I plan to personally tell Georgina about any donations (wish list items, PayPal, or checks) that come into Missing Pet Partnership “In Honor of Buddy” because I know she would be happy. I also hope that by next week Buddy will come out from under his bed and I can get a picture of him with Georgina. Although I suspect that because I cut his freedom short, Buddy would be happier if he never had to look at my pet detective face again!